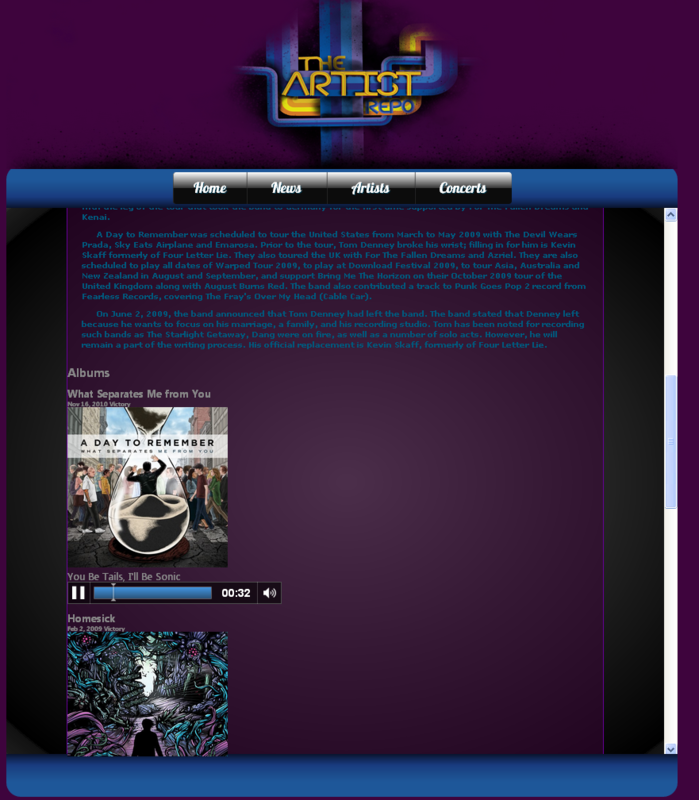 The premise of this site is to be able to view band information, news, and listen to samples of songs from different bands. 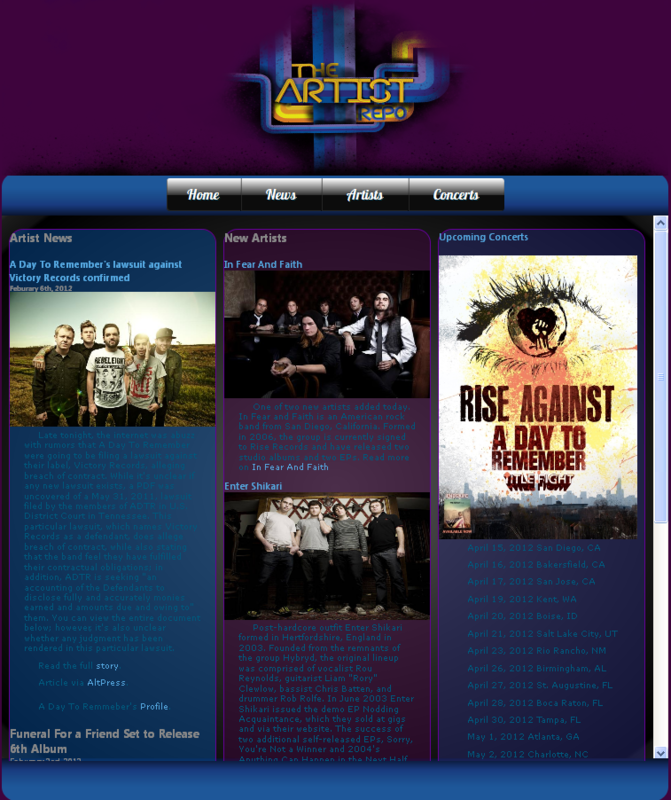 The first page is my home page which contains 3 columns displaying news, new artists added to the site, and upcoming concerts. News articles provide links to a profile on The Artist Repo, a link referencing the article I used in the post and a link to the entire story in the news section of my website. The menu buttons have a gradient and a mouse hover effect. I have placed everything within a scrolling container to give the site a more structured look. 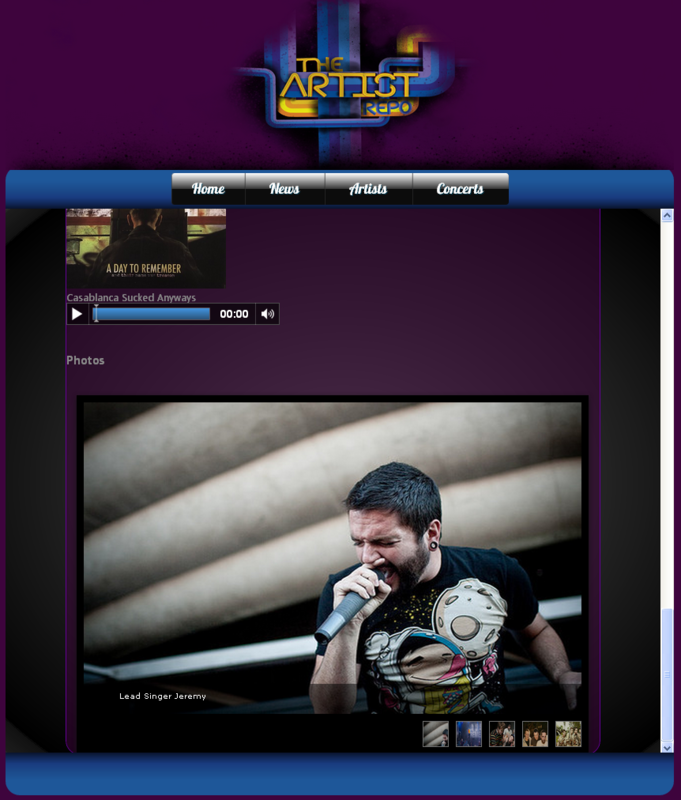 My artist profile page contains an artist biography, full length albums that have been released by the artist, and a photo gallery of the artist. In the album section is a streaming song from the album to give visitors a taste of the album and the artist. This is only my first website I designed and coded this in two weeks. I accomplished most of what i wanted to do with this site and overall I think my site turned out fairly good for being my first time using html and css. I developed this for use with my first website that i created in my ART 365 class at Towson University. Creating the Dark Knight Opening credits required a lot of thought to accomplish a cohesive sequence. I was initially stuck on the idea of the actor playing cards. After a little thought i decided why not film cards dropping? It would be more realistic than trying to create it in after effects, so i decided to go for it and see how it would turn out. 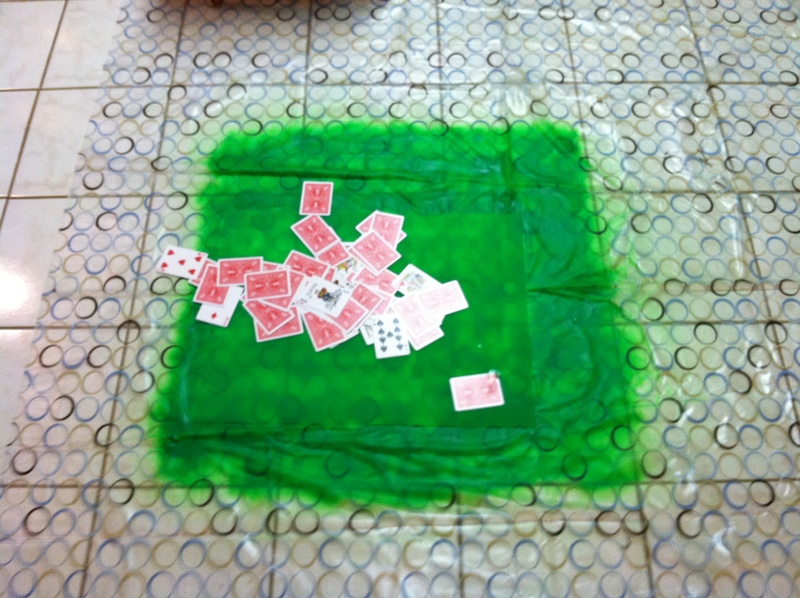 My initial idea was just to drop playing cards, but after one thought it snowballed into another, “Oh! I could do this”, or “It would be really cool if I did this!” My mind took me all over the place to develop what i finally had in the final video. After having my overall idea i had to gather supplies. 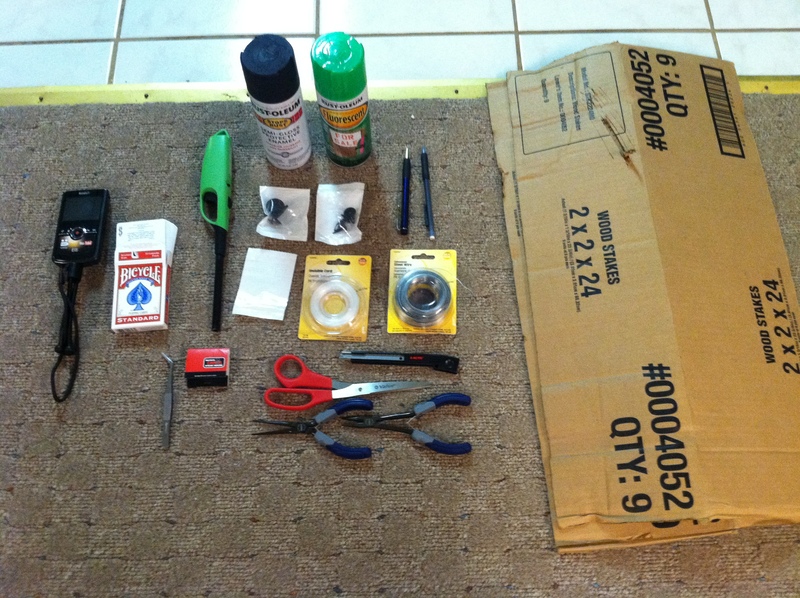 Luckily for me I work at Lowe’s and had all the materials I needed to complete this project including the cardboard! Not pictured I also needed a sheet of glass (for a burning surface) and i used a shower curtain to keep the spray paint off the floor (neon green for green-screening). After filming a couple videos of card drops, I found the best video by the stroke of luck with the joker card being face up! 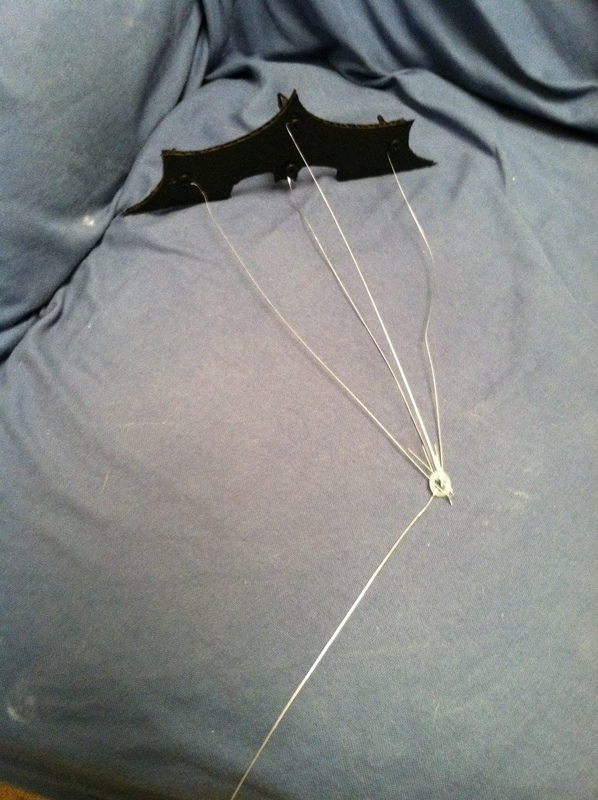 So then i had create the batarang from the movies so i could do the next part of my video. Printed picture taped to cardboard for guide. 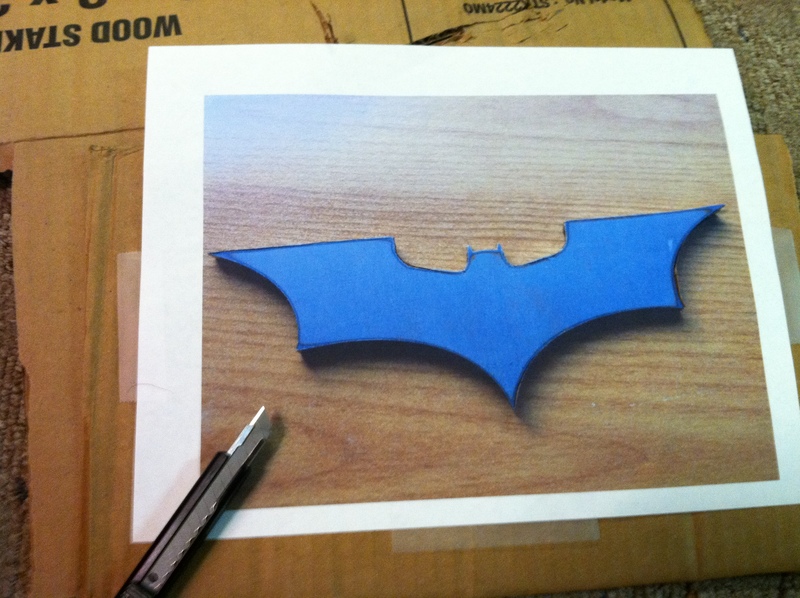 Final cut out of batarang. My plan for the batarang was to pull the batarang up out of a burning pile of cards. 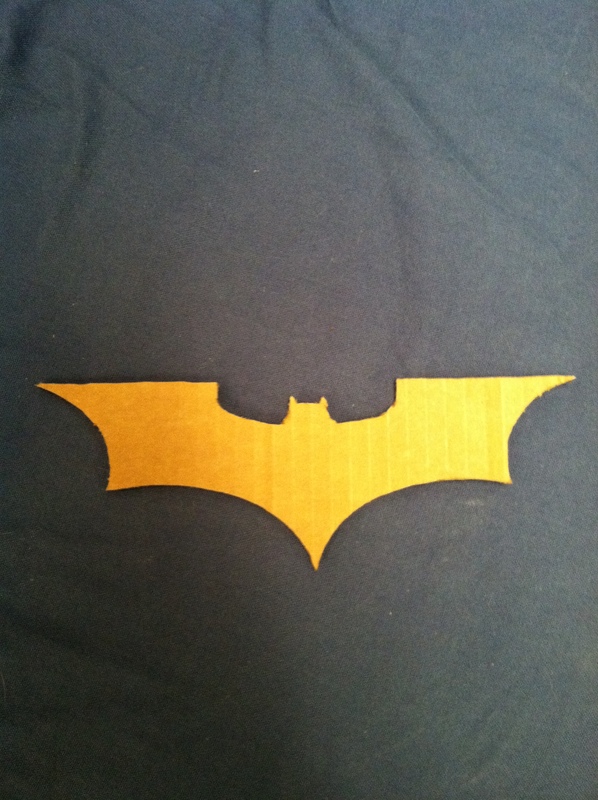 To achieve this after cutting the batarang out i had to spray paint it black. After spray painting it I had to figure a way to pull it up while keeping it level so the weight of the cards would not make the bat sway. Thus, I had the idea to attach four wires at four different sections on the bat, 1 on each wing, 1 on the head, and 1 on the tail. Final rig for the bat. Once the rig was created i then placed the bat on the glass and placed playing cards on top hiding the bat. The final step was burning the playing cards. Unfortunately, the cards did not burn well by fire alone. I ended having to use gasoline to accelerate the fire and make the cards burn. Dangerous I know! But, I had a fire extinguisher and a large lid to cut the air off from the fire if it got to out of control. After all the preparation i ended with the final clip in the video sequence, well with a little editing, and cutting. Nevertheless this sequence turned out better than i could have ever expected. I had many firsts in this project including, filming, green screening, creating (albeit) simple rig, and more. Im really happy how this turned out and I hope my future projects improve further!